Craig supplied me with a copy of this novel. Like Craig’s short story Both Sides of the Portal this is a Gaming novel, based around real life Gaming. As I said before what I know of gaming can be written on a postage stamp, my only experience is with Legend of Zelda on the Snez back in eighties….tells you a lot doesn’t it!! This time we meet /Troy, single male – lives with parents. To be honest I think Troy fits the Geek Gamer stereotype to a T. He lives, works and trains in order to fulfil his cravings to enter another world via Stillwater. What is Stillwater ? – well it seems a company have found a way of opening a portal to another dimension, and people rich enough can pay and be transported through to play out real life scenes with real people. Its expensive and Troy only manages to go about once a month. His parents don’t know of his visits and his alter ego Kalyan his a product of his imagination creating a character . All Stillwater visitors do the same so when they meet through the other side they could be anyone – the names and appearances have changed so no-one knows who they are in real life, well the reality we live in. The world through Stillwater is real also but on a different plane, however its not without danger – this is playing for real and not a game of “Life ended do you want to play again?”. Kal meets up with a small group and they agree to form a group and buy a consignment of silks and spices to trade – of course the trade is illegal and that’s where they’ll make money as well as having the adventure they all seek. Its risky though and they face brigands, cut-throats and others keen to strip them of their cargo as well as the problems of bribing guards and getting the cargo sold. As they don’t know each other for real they take a risk in trusting each other – and they need to be careful because they’ll rely on that support to save their lives. Despite my usual aversion to fantasy of this type I was quickly immersed in the world Craig has created. Even for none readers like myself of this type of fantasy its easy to follow, and I felt as if I was there with the characters, fighting alongside them, holding my breath til they were safe at times. Of course nothing is straightforward, there are problems with the trade, Stillwater rules are broken, people get killed and subsequently the Stillwater team get involved as they do when a cover up is needed to keep the other world out of this worlds eyes. When people die there they need to arrange a story for the death here that will be believed, and not cast any glances to the secret world of Stillwater. The trade goes wrong, there’s deaths and betrayals and Troy comes back a bitter man vowing vengeance. Stillwater won’t allow anything that exposes their world though and he’s warned off – but then they discover things that make them need his involvement to find out the truth. 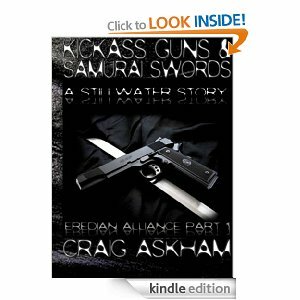 Its a great book, short but realistic and I can see that there’s lots of opportunity for further Stillwater adventures and take the world Craig has created into a series. I like the way the Stillwater reach goes so far that the reader is left wondering just how its all done. Its like a conventional type thriller but with two worlds to carry the story, and the added dimension of the unforeseen through the portal into the other world and staying within Stillwater rules – and they are rigorous about keeping hidden. Stars: well its well written and edited, priced at £2.06 for 120 pages on kindle. Its not one I’ll read again but I did enjoy it as a one off and for sci-fi type fantasy readers its a fun read. So 4 stars from me. Maybe it was from being more familiar with the setting from reading the short story but I was surprised at how much I actually enjoyed reading this – its the type of fantasy I normally avoid but was easy to read and get involved in.